A new baby arrives, and with it comes excitement and joy. When a precious little one is born, it’s hard not to rejoice and celebrate the new life. 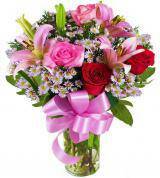 It’s natural to also extend congratulations to the new parents as well. 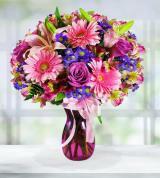 A bouquet is a great way to do all three: rejoice, celebrate, and extend well wishes on the birth of a new baby. Flowers are vibrant and cheerful and can contribute to the air of happiness in the hospital, in the nursery room at home, or in one’s house in general. 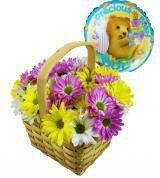 At Avas Flowers, we have an assortment of new baby floral arrangements and other gifts. 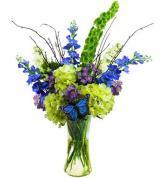 Our premium flowers are easy to order, and courtesy of our affiliation with local florists across the country, we can provide delivery nationwide. 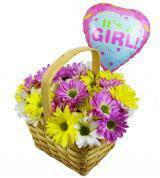 When celebrating the birth of a new baby, flower arrangements are a popular choice. 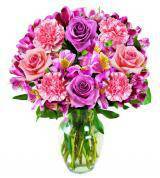 The key to giving a floral gift is to select one that is not only attractive but one that has been purchased with thought and care. 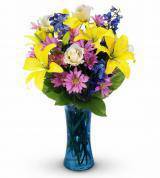 At Avas Flowers, we make it easy for you to make a thoughtful decision by offering some of the most attractive floral arrangements to give in celebration of a new baby. While you’ll find plenty of choices when it comes to ordering a floral baby bouquet, you’ll also find that we offer balloon bouquets, balloon and flower arrangements and other arrangements as well. 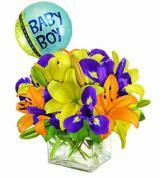 The birth of a baby isn’t the only occasion that warrants the gift of a baby bouquet, however. 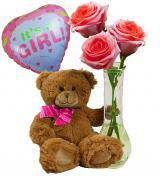 Congratulations are also in order when parents who are adopting bring home their new baby. 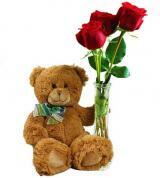 Flowers are just as relevant and appreciated regardless of whether the baby is a newborn or several months old. 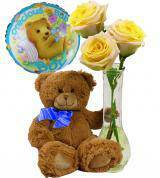 When browsing our selection of flowers, balloon arrangements, and other gifts for new babies, you’ll find that you are faced with several choices. When choosing a gift for a baby, some people gravitate toward specific colors for girls and boys. On this page, you’ll find flowers and gift baskets in shades of pink for baby girls as well as blue gifts and flowers for new baby boys. Other people choose to select gender-neutral colors for their nurseries and baby items and use colors such as yellow, light green, or orange. 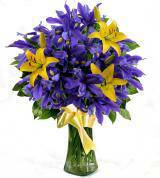 This is also an option when ordering a bouquet of flowers or balloons, as our selection of flowers, colors, and arrangements are diverse. 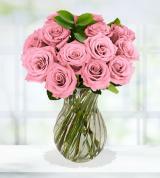 Avas Flowers is the perfect choice when it comes to choosing the right flowers for the birth of a new baby. 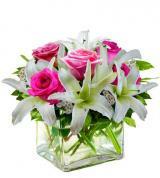 As an online florist, we are able to offer you an assortment of quality baby flower arrangements. 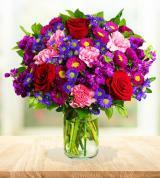 When you buy from us, we can even arrange same-day flower delivery on eligible orders. 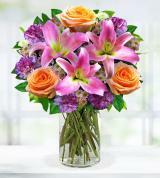 We also offer excellent customer service to all of our customers. 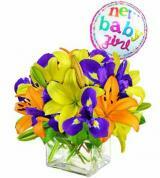 If you have any questions on how to send flowers or about any of our available arrangements or gifts for babies, simply contact us. We are available by phone 24 hours a day, seven days a week. You can also fill out our online contact form and we’ll be happy to help.